Fujifilm has unveiled what may be the nicest-looking compact we have seen all year – the Fujifilm FinePix X100. 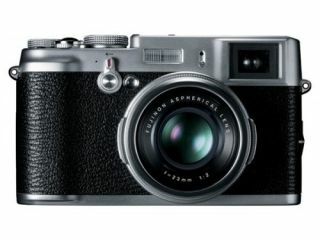 Fujifilm has given the X100 a decidedly retro feel, offering up a chassis which emulates the look of a Rangefinder. But underneath the classic exterior are some pretty meaty features, which point to the higher-end of the compact market. Inside you get a 12.3MP APS-C CMOS sensor and a newly developed EXR processor, while the lens chosen for this fixed-lens camera is a Fujinon 23mm. Also on board is a hybrid viewfinder, which combines an optical viewfinder and an electronic viewfinder system, which mirrorless camera systems like the MicroFourThirds range pack. Other features include: a 2.8-inch rear LCD, hot-shoe connectivity, 200-6400 ISO and 5fps continuous shooting. The camera supports SD / SDHC / SDXC memory cards and its dimensions are 127x75x54mm. There is also the ability to record 720p movies. Fujifilm is being a bit of a tease about when we will actually be able to get the camera. The company has so far only mentioned that UK release date will be early 2011, with no hint whatsoever on pricing. The camera was unveiled at Photokina 2010, so we are hoping more details are released once the show hits its stride. For more details on the Fujifilm FinePix X100, head over to PhotoRadar.com.